Our class information is all viewable on our website. Full pictures, descriptions, dates, prices, etc. are included. You can even send an online registration by using the drop-down menu under "Classes". Phone and drop-off registrations are also gladly received. Saturday, May 12, is our in-store registration day with doors open at 8. I know that a lot of you like to see the samples in person before deciding what to sign up for, so come in and take a break from all the hustle and bustle while you enjoy some eye candy! 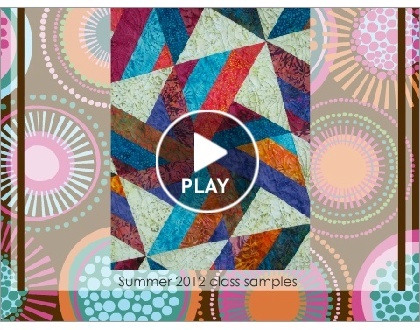 Many items have kits available, and we are always ready to help you pick out your own fabric choices if you prefer. Things are hopping in the shop today --hint, hint-- it's the kick-off of the Twin Cities Shop Hop! Special guest Linda Hohag is here with some gorgeous samples, and this afternoon Terry Atkinson will join us!